A “spark bird,” I learned from B.J. Hollars’ Flock Together: A Love Affair With Extinct Birds, is the bird that gets one interested in birding. Presumably, it takes you beyond casual observation and into impassioned enthusiasm. 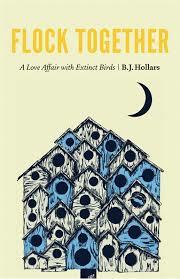 In Hollars’ case, his spark bird leads him into an exploration of extinct birds, which leads him to investigating the lives of bird experts, living and dead, many of whom have made significant contributions to environmental causes, which of course, he discusses in relation to the fact that most extinct birds are so because of us humans. While I have never experienced a spark bird, and while I’ll admit that even after reading Flock Together, I’m only slightly more interested in the birds themselves, I can say that I’ve experienced a spark squirrel. I was nineteen, I had recently moved from California to Maryland to be a Mormon missionary, and I was walking through a suburban neighborhood when I noticed a squirrel leaping in the trees above. While it certainly wasn’t the first squirrel I’d even seen, there was something about the grace of that moment that caught my eye and my imagination. I can—somewhat sheepishly—admit that the quiet, gray moment with a gray squirrel leaping against a gray sky felt something like a religious experience, a world of wonder opening up before me. I became obsessed with squirrels. Just watching them frolic brought me pleasure, learning about their habits became endlessly fascinating. Like many other enthusiasts, I dedicated a great deal of time thinking about them. I started collecting squirrel t-shirts. They became the focus of my MFA thesis. When my girlfriend and I broke up, she listed squirrels (among other things) in her list of concerns, and when that girlfriend and I got married there was a squirrel-themed scavenger hunt at our reception. I eventually found myself in England, hiking for hours a day, finally seeing a single endangered red squirrel after two months of extensive looking. Hollars accounts a similar progression (though of course the details are slightly different.) He sees a bird, the then researches birds. His research, which is both the narrative and the substance of Flock Together, takes him into quite a few museums, where he finds various relics of extinct birds, especially following the fate of the Ivory-billed Woodpecker, also called the Lord God Bird, which went extinct early in the last century and then was (probably) mistakenly claimed to still be alive at the later end of the century, raising the hopes and dreams of many ornithologists. He befriends prominent experts. He travels into the wild to count birds and to look for the remnants of a famous birding hermit’s cabin. I felt especially akin with him when he recounts dragging his family away from a vacation to seek out birding lore. For a long time I thought I might be just a little crazy to have fallen for something so common in such a simple moment, but knowing that the birding community has a name for such an event, even for the creature itself, is relieving. Flock Together spends a good amount of time—in fact, more than in directly talking about the birds—talking about those who are infatuated with birds. Besides getting to know Hollars, we also get meet Steve Betchkal, a modern bird expert, and Francis Zirrer and Bill Schorger, unlikely friends corresponding in the 1940s, as well as a smattering of museum curators who share Hollars’ fascination with the birds that were once alive but aren’t now. As the subtitle of the book suggests, the birds themselves aren’t really the subject matter: it is the love affair that felt more interesting to me, with whom or what was secondary. And for each of the love-stricken characters, including Hollars himself, I was much more taken in by their dedication, enthusiasm, and sometimes even irrationality than I was by the birds themselves. “The crows brought me no joy, but my noticing did. There are all sorts of common things in this world that can catch our “ear and eye,” which lead us from that first sighting to things subtler and more infinite. Though the sparks may be different for each writer—spark animals, spark books, spark injustices, spark happenstances—the progression tends to be the same: from common to common to common until we find the less common, the rare, the practically unattainable, the endangered and then the extinct, finding out about everything we can because we’ve found that we now care immensely about some smaller corner of the world we didn’t even know about last year, and we need to name its parts because “when we don’t know the names of things, we don’t have a problem forgetting they exist” (Hollars quoting Betchkel). Then, we must share those names with our readers because we realize soon enough, as I did when looking for squirrels in England, as Hollars does as he contemplates the fate of the Ivory-billed Woodpecker, that the things we love are fleeting, if not already gone. Scott Russell Morris is an English PhD candidate at Texas Tech University, where he also teaching creative writing and literature. He has an MFA from Brigham Young University. His essays have previously appeared in Brevity, The Chattahoochee Review, Superstition Review, Proximity, and elsewhere.